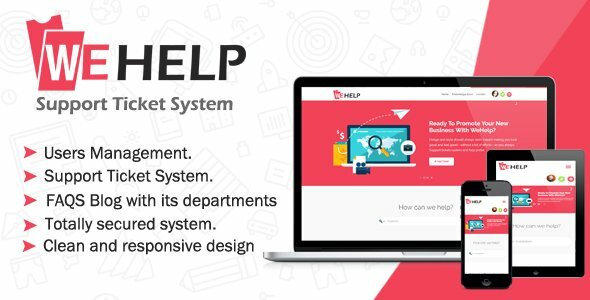 WeHelp is a PHP system developed to offer your clients a great user experience, Clients can search for FAQS that added by admin, if they don’t get any result they can submit new Tickets or Bug Reports and keep in touch with you or your Agents. Also, when the support is done and a ticket is closed and give it priority. WeHelp is built on believing that serving better to your customers is key to leading in now day markets. By providing professional support to your customers rapidly you can build trust of customer which again most vital part of success. For this purpose, we build powerful support ticket management platform which allows you to manage all tickets with multiple ticket status as per requirements. Built on powerful CodeIgniter Framework that has been tried and tested by millions of developers. Passwords are encrypted using PHPass library to make sure your data is safe. Users can register for an account using the quick and easy register Popup. Login System comes with a Forgotten Password, to allow users to reset their password via email. Any register user can login/ forget password. Having awesome profile include member information and his tickets. Mange or update his information in profile settings (country, name, username, gender, user profile, ...). Clients can easily submit ticket by creating an account. Client submit a ticket with (subject, message, attachment file). Receiving E-mail for each ticket reply with respective ticket status. Client Search for his problem in knowledge base section. Contact with support using contact form and contact information. Flexible control panel system with full options. Only admin role can login admin panel. Change website settings(name, logo, favicon, timezone, site description,...). Change website SEO settings (meta keywords, meta description). Change Contact information (email, phone,...). Manage Members (Edit, Delete, Add and view member information) and change their member role (Regular member, admin). Create unlimited departments for articles and manage it(add, edit, delete, view). Create unlimited articles for common problems and mange it (add, edit, delete, view). Mange tickets and reply on it, mange the status otherwise closed or open and priority of it (hight, low, medium). Totally with this admin panel can manage and control every thing appear in website with full option. Single awesome page for article with more details, related articles and latest articles added. Custom print page for article. User Profile included all details about client and his tickets. Login/ register/ forget password modal. More features will coming up. 1- Admin receive an email for new tickets and tickets replies. 2- You can attach pdf file in tickets. -- Check Documentation for changing files. 1- Adding created option in user module. 1- Creating Note option for administrators when they are replying on tickets, This notes appear to administrators only. 2- Last reply on each ticket to make administrators and client filter they tickets and reply, you need to run this query "ALTER TABLE `tickets` ADD COLUMN `last_reply` DATETIME NULL AFTER `important`;". 1- TextEdotir allow different functionality with XSS "read documentation carefully to install it". 1- Update UX for Responsive. 2- Delete Conformation alert before delete record for each admin panel module. 2- Cut Images URL from(logo & favicon) Database. (You also need to replace view files).